I’m excited today to be joining up with some of my blogging friends in a drop cloth challenge. 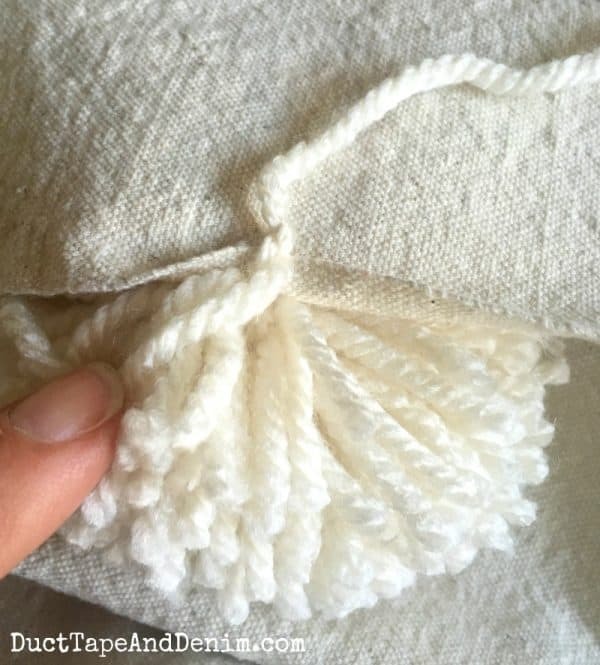 Drop cloths are so much more than a way to keep paint off the floor. They’re one of my favorite materials for DIY home decor projects. 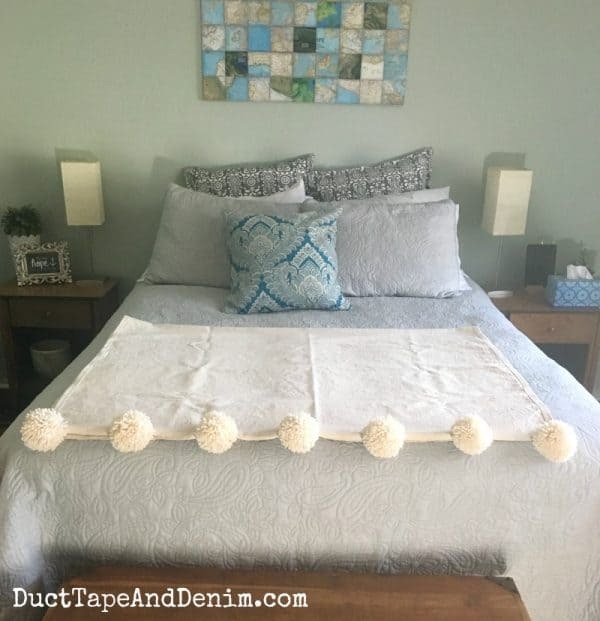 Today I’m showing you how I made my pom pom throw blanket from a drop cloth I picked up at OSH. I was inspired by this blanket I saw online. I found a few pom pom blankets on Amazon, too. I started by tearing the drop cloth into the size I wanted and washing it. I just made one tear so three of the edges were finished — one was hemmed and the other two were selvage edges. So I hemmed the torn edge to match the opposite hem. In the photo below the top hem is what came on the drop cloth and I sewed the bottom hem. It was a little under an inch, folded over twice with two straight stitches down the length. I just tried to match the original as close as possible. 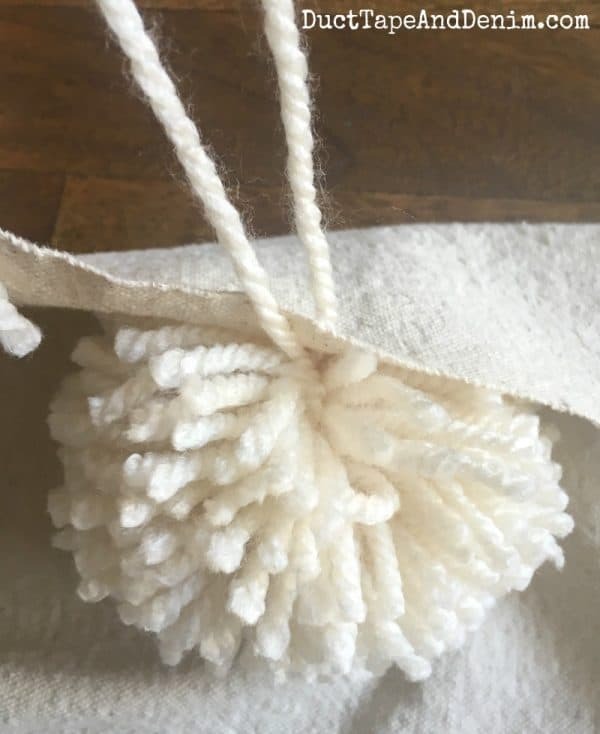 And here’s a video that shows you how to make a bunch of pom poms all at once. 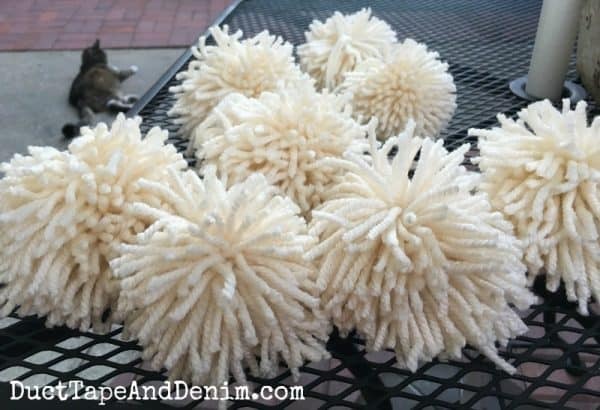 I didn’t do it this way but I’m gonna try it next time I need some pom poms! 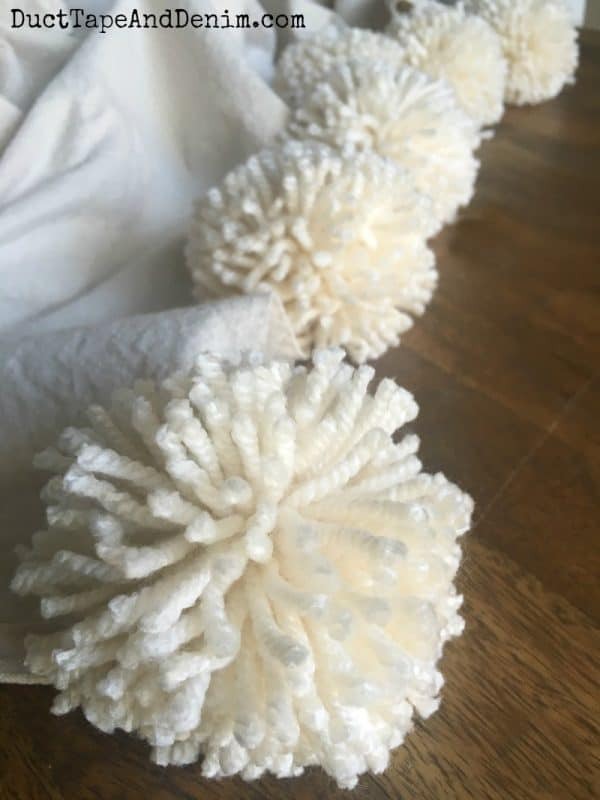 To figure the placement of the pom poms I folded one of the selvage edges in half, marked it with a pin, and spread the other pom poms across evenly. They ended up being about 7 1/2″ apart. I left the yarn ties longer so I could easily find them. Using a yarn needle I threaded one side through the selvage edge. Then I tied the yarn ends in a square knot. I trimmed the ends to be a little shorter than the pom poms so they would blend in. Here’s the completed throw in my cozy reading corner. And here it is spread out on my bed. These turned out even better than I was expecting. I’m loving pom poms! This throw now has a home on the end of my couch so I can pull it over me when my hubby turns on the AC! Notice it’s right next to my old end table. This is going to be my next painting project! Take a look at the Facebook live video where I shared my idea. Thanks for reading my blog! 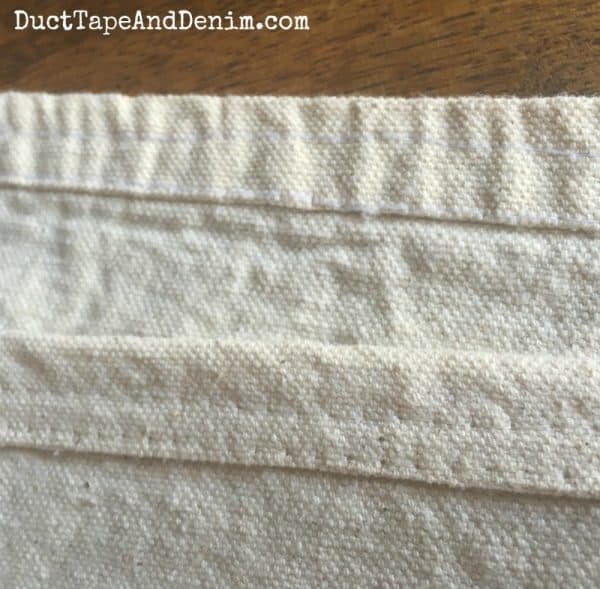 Leave a comment and let me know if you’ve ever made anything with a drop cloth. 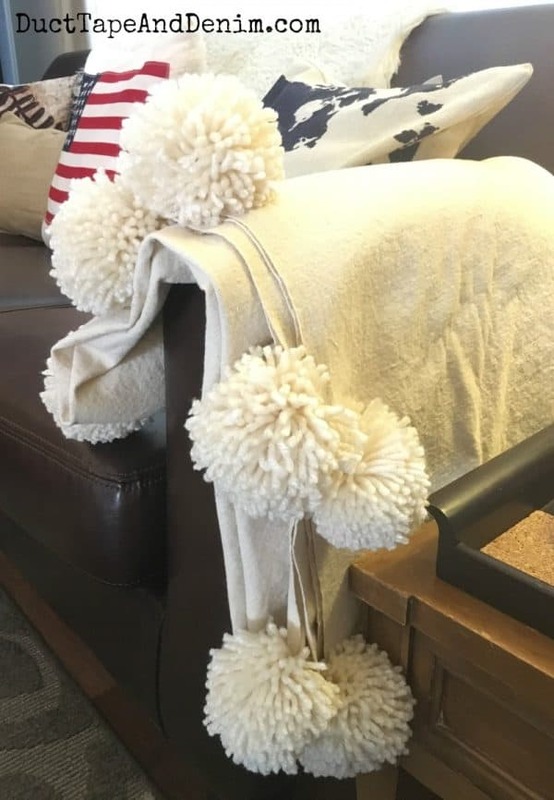 Love this fab pom pom throw! They can be very pricey – and you created a beautiful alternative! I love it! 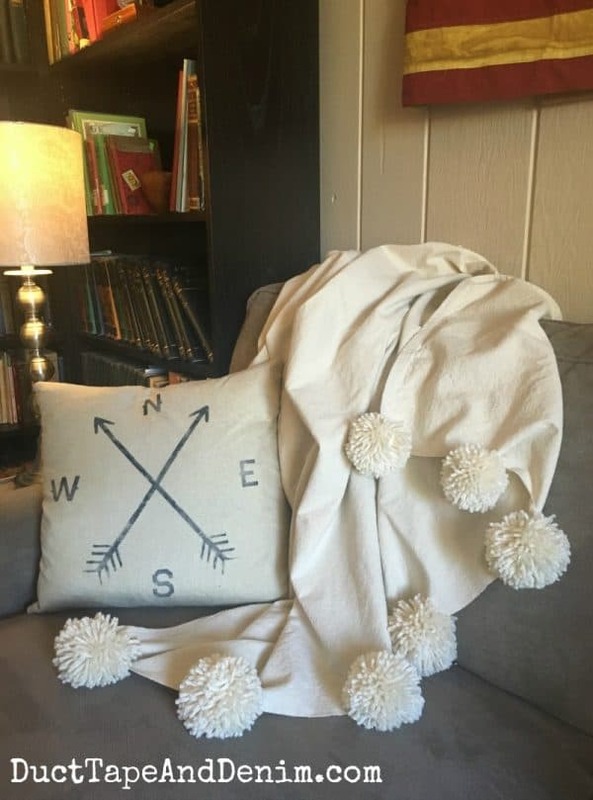 I have been wanting to make a pom pom pillow, but I like the idea of a blanket even better! Now I need to make a matching pillow! This is so cute! What a great idea! Dropcloth is so inexpensive and the pom poms femme it up! These would be great dorm gifts for incoming college freshman! 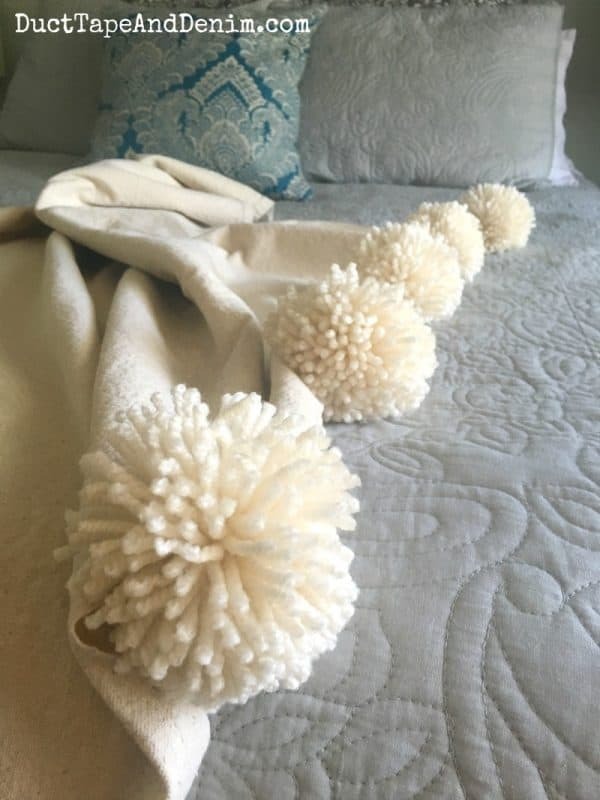 I made a bunch of pom poms for such a blanket. (They have been sitting in my closet for a while). I didn’t know what to attach it to? A sheet? ? ? A dropcloth! Perfect! 🙂 Thank you!